This page includes The First Day Cover Collecting: Spotlighted or in Passing columns from the 1999 issue of Across the Fence Post. For the most part, the ranks of philatelists are filled with courteous and ethical people. It has been my observation, however, that one aspect of collecting ethics is sometimes overlooked. I have found this breach of ethics to be quite prevalent among cover collectors and those who serve the needs of cover collectors. Regardless of what you collect or observe others collecting, it is never your province to criticize another's collecting interests. I firmly believe that every collector has the right (not the privilege) to set up his/her own collecting goals. Dealers or venders who serve the general philatelist tend to be respectful of what the collector desires. Unfortunately, this is not always true of cover dealers and collectors. Before I go any further, and to be fair, I must say that whenever I have run into criticism from others involved in cover collecting, it has always come from East or West Coast people. Never has it happened to me where the source has been a Midwesterner. You might say that I am a sectionalist. Perhaps I am, but this is my personal experience. Of the three times I have been criticized for my collecting interests, two of' those instances took place at national shows and emanated from two rather authoritarian-type collectors. At the time, I gave no response because I was then and am still convinced that no response was due. In the third instance, I wrote to a very well known and highly successful cachet maker to ask if he would please send me some of his cacheted covers with official first-day cancels rather than his unofficials, as he had been doing. (Unofficials: first-day cancels that are applied at postal sites other than at the first-day site/city, but dated on the first day.) Judging from his response, one would think I had spit tobacco juice in his face, or something more offensive. He sent back photocopies of his cacheted unofficial-canceled FDCs with handwritten comments in red. He wrote that I had no business asking him to offer official cancels on his very distinctive covers after all the laborious effort that he put into obtaining the unofficials. He further stated that I was behind the times because I was still collecting FDCs with official cancels, and that I should immediately change my collecting methodology. I instantaneously terminated my business relationship with him and that act remains in effect today. I have no quarrel with what the other guy collects, and I have so stated many times within this column. I don't like unofficial cancels on my FDCs, but if you like them, you have my respect and will not hear any criticism from me. I am always interested in learning about your collections, what you have, what you have to say about what you have, your collecting methods, and your stories about your collecting experiences. Do I have any FDCs with unofficial cancels in my collection? Yes, I have a few. In fact t have been asked to write an article for this series on the subject of collecting unofficials. This is a task that I might do in the not too distant future, but not until I have done some research and interviews. If you collect unofficial-canceled FDCs, please contact me with your view on this subject. My snail-mail address is listed above along with my e-mail address. If you come across a collector who does not like what you collect and says that you are wrong or don't understand philately, show him your back and put some distance between you and him. If you encounter a dealer or vendor who is critical of your requests, you don't have to listen to him or do any business with him. I certainly would be suspicious of such a dealer. I would also question the quality of the material that he is trying to sell. All things considered, I am most thankful that both critical dealers and captious collectors are in the minority. No discussion of the focus of this column would be complete without mentioning unofficial first-day covers, which have become immensely popular these past 15 or more years. Although I'm not interested in collecting them, I'll maintain my policy of not criticizing what others collect and refrain from stating my reasons for lack of interest in this area. An unofficial FDC is defined as a cover with a stamp affixed to it that was acquired on its first day of issue at the first-day post office. It is, however, canceled at another post office with the first day of issue date. There are no hard and fast rules to follow when deciding which unofficial cancels should be placed on specific covers. Collectors are free to choose any cancels they wish for their unofficial FDCs. Generally speaking, though, many tend to choose unofficial cancels from post offices that have names related to the subject of the new stamp. For example, it was brought to my attention while I was serving as a volunteer canceler at the first day of the Wisconsin Statehood stamp that those who were seeking unofficial cancels tended to select post offices having the word "Wisconsin" in them. Specifically, I noticed that the post offices in Wisconsin Rapids and Wisconsin Dells were often mentioned. Another collector stated that he was going to Belmont, WI, the site of the first meeting of the Wisconsin Territorial Legislature in 1836, for his unofficial cancels. In spite of my disinterest in unofficial FDCs. I do have a few in my collection, which will remain there permanently because of their cleverly contrived cancels. One is for the Endangered Flora se-tenant issue of June 7, 1979, which made its debut in Milwaukee, WI (Scott 1783-86). This cover carries the standard four-bar cancel of Wild Rose, WI. Other unofficial FDCs that I have are for the Letter Carrier stamp issued August 30, 1989, in Milwaukee, WI (Scott 2420). One of my covers for this issue was produced by Lois Hamilton. It bears a Bigfoot, TX, cancel. The other cover, contrived by Fred Collins, was canceled at Footville, WI. I also have a set of unofficial FDCs for the Lighthouses issue of April 26, 1990 (Scott 2470-74), that were canceled at the Lighthouse Point Branch. Pompano Beach, FL. Some years ago, when I was at the first-day ceremony for the 4-cent Carl Schurz stamp of June 3, 1983 (Scott 1847), I overheard collectors stating how they were going to Germantown, WI, for their unofficial cancels. A collector friend of mine came up with the idea for an unofficial first-day cancel from Monroe, WI, for the stamp honoring movie star Marilyn Monroe (Scott 2967). Perhaps the attraction of unofficial FDCs is the fact that the possibilities are limited only by the collector's imagination and his/her ability to travel to the selected post offices. In any case, unofficial FDCs are unusual items that can spark the telling of many interesting philatelic stories as collectors socialize with one another. If you are so inclined to obtain unofficial cancels on your FDCs, you might run into reluctance on the part of some postal clerks to apply such cancels. I've been told, though, that if you recite the specific postal regulation reference, most clerks will honor your request. Tell them that unofficial cancels are defined by postal regulation No. 233.9, which appears on p. 151 of the Postal Operations Manual. "Requests for cancels with stamps and postal stationery not in nationwide release on the date shown in the post-mark may not be honored." Thus it appears that postal regulations and practice are at odds with one another. I notice, however, that the Linn's statement refers to requests for pictorial cancels that are requested by mail. It might be different for handback service. 1 received a suggestion to address the subject of first-day cover collecting terminology. Although the subject wasn't included in my original outline for this series, it certainly does merit a few lines, more or less. The American First Day Cover Society publishes a booklet titled First Days New Members Handbook. Besides containing pertinent information about the society and first-day cover collecting, the booklet includes a glossary of 161 FDC collecting terms and abbreviations. Most philatelists know about 53 of these terms; with another 50 or so that are common to the stamp-collecting hobby in general. Since the booklet is devoted to the beginning FDC collector, some of the glossary listings might be considered as being somewhat elementary. • General Purpose (GP) - A cachet with a general design that is non-specific and may be used with any stamp subject. Also, all-purpose. • Hand Drawn (H/D) - A cachet applied to a cover by hand with pen, pencil, brush, chalk, or other art media. Each cachet is made individually and is an original. • LA - Label Addressed - Refers to a method of addressing a cover. • Mellone Catalog - A series of catalogs for various time periods. They feature cachet illustrations with assigned code numbers for identification. • OE - An abbreviation, which indicates that a cover has been opened at the end or side. • Official FDC - Any FDC with an official government postmark. This term is often misused for covers with sponsored cachets. • Freak - An abnormal variety created by an unusual circumstance, and not repeated with regularity. For example, an FDC may bear only a portion of a postmark because the cover was misfed into the canceling machine. Used in contrast to "error. " • Classic - The period prior to 1930 during which few First Day Covers were serviced, and cachets were not common. • Esoterica - Any item, other than a cover or envelope that has been First Day cancelled that doesn't fit any of the regular collecting categories. Every hobby, profession, trade, and the like has dedicated jargon or terms used for the purpose of communication in an abbreviated manner. Consequently, regardless of what area of philately you choose, it be-hooves you to join a specialty society which embraces that interest. Such societies provide education and up-to-date information about your specialty, as well as help in learning the jargon or terminology. Servicing one's own first-day covers allows the collector to create some unique collectibles. Thus far we have seen how designing your own cachets, as well as using unofficial cancels can do this. Expanding upon the opportunities for creativity, you can also resort to making combo covers. This simply means using other stamps on your FDCs, in addition to the stamp being honored. As always, there are no hard and fast rules for making combo covers, although most collectors try to select additional stamps with subjects related to the new stamp. I'm sure that many of you have seen some of the combo covers created for the Wisconsin Statehood stamp issued last year. 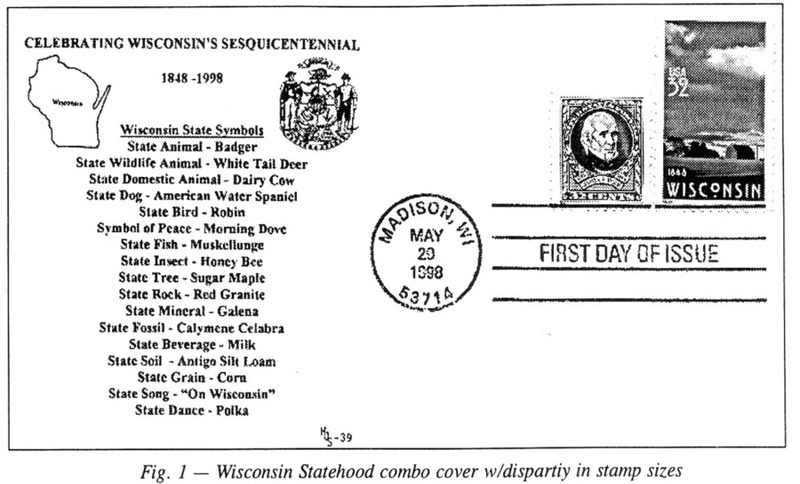 The most obvious combination for this stamp was the addition of the two previously issued Wisconsin anniversary stamps, Scott 739 and 957. One combination that was overlooked by most collectors and servicers was the addition of the James K. Polk 32^ definitive stamp that was issued in November 1995 (Scott 2587). Polk has a very strong tie to Wisconsin state-hood. It was President Polk who signed the bill in 1848 admitting Wisconsin to the union. Unfortunately, though, because of the disparity in stamp sizes - the definitive-sized Polk versus the commemorative-sized Wisconsin Statehood stamp in portrait orientation - adding the 32^ Polk stamp tends to diminish the cover's attractiveness (Figure 1). For many years, the U.S. 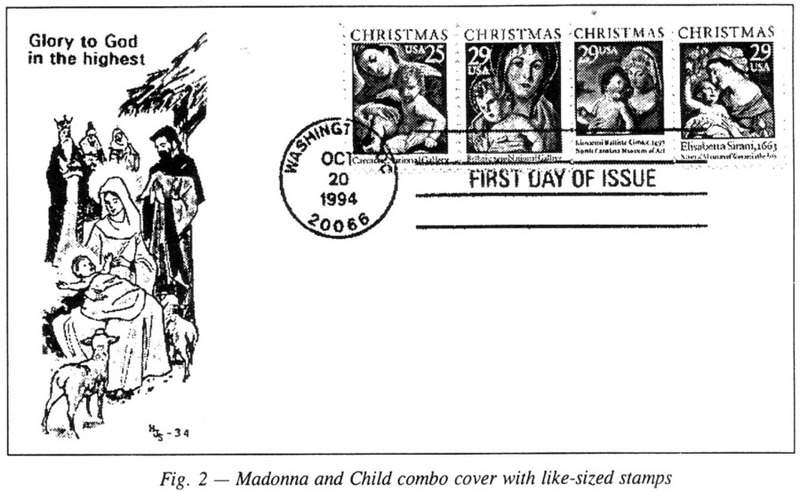 Postal Service has bored us with various Madonna and Child artwork on its Christmas stamps. The first Madonna and Child was issued in 1966, and since 1978, we've had one each consecutive year to date. During the years 1982-94, I made combo covers out of the many Madonna and Child stamps available, calling them my "gallery covers" (Figure 2). I found that matching the size of the stamps on these FDCs resulted in a more attractive finished product. But it was not always easy since the USPS has issued these stamps in three sizes - the original commemorative size, the usual definitive size, and the newer jumbo definitive size. In some cases, mixing Madonna and Child stamps of different sizes worked out tolerably well, even though it does violate one of my rules. into color coordination, but that would be ridiculous. When it comes to making combo covers, the best suggestion I can make is to maintain a good supply of past U.S. issues of a variety of subjects. Of course, it complicates matters when one does not have sufficient advance knowledge of which new issues might be coming down the pike. If, however, you acquaint yourself with various future anniversaries of national interest, or people or organizations that might be honored on future stamps, as well as reading the philatelic press, etc., it is possible to be somewhat prepared. You might also be able to acquire the stamps you want by trading with your philatelic friends. they are not mailed, some postal clerks might allow you to cancel covers with less than the first-class rate. Combo franking of FDCs allows the opportunity to create something new, interesting, unequaled, and quite collectible. Try it.